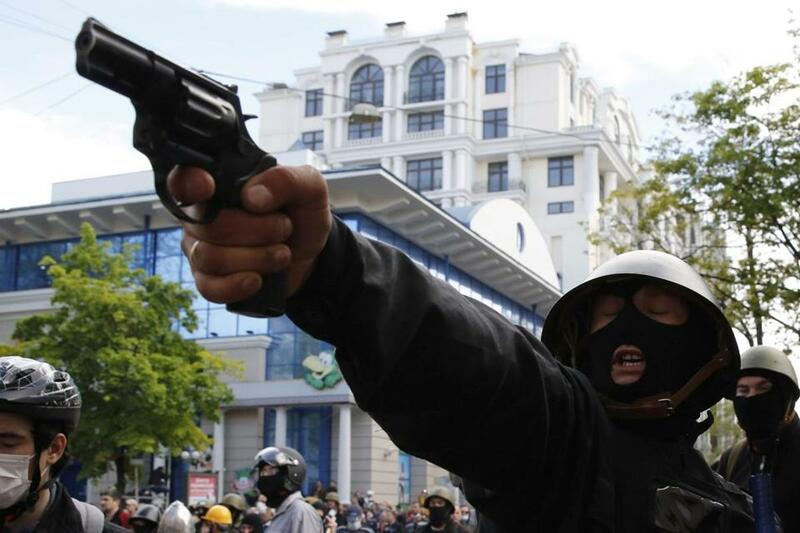 A pro-Russian activist aims a pistol at supporters of the Kiev government during clashes in the streets of Odessa May 2, 2014. In the idealized world, borders are sacrosanct, and all countries are fully independent. The global system does not really work that way. Big powers always try to subdue their weaker neighbors. They seek a sphere of influence — a ring of buffer states that need not be vassals but must, in the end, accept the fate to which geography consigns them. Much outrage is being vented in Washington over Russia’s annexation of Crimea, formerly governed by Ukraine. Secretary of State John Kerry called Russia a “rogue state.” President Obama has reportedly concluded that he can now “never have a constructive relationship” with Vladimir Putin, the Russian leader. Yet Russia was acting as big countries always have. It seized Crimea after the pro-Russian government of Ukraine — corrupt but legally elected — was deposed in an American-supported coup. It was not realistic for the United States to presume that Russia would tolerate this. After the Soviet Union collapsed in 1991, Americans treated Russia as a defeated state. We took advantage of Russia’s weakness and brought the nuclear power of NATO to within 85 miles of St. Petersburg. Inevitably, we were not able to keep our foot on Russia’s neck. When Russians arose, many were resentful. This kind of resentment provokes atavistic nationalism. Demagogues cater to it. Emerging from years of what they consider humiliation at the hands of the West, Russians are pushing back against the new order that was imposed on them. Their actions in Ukraine do not constitute a radical departure from international norms. In fact they are quite the opposite: the re-enacting of a historical pattern that is as old as empires. Crimea gives Russia its only access to warm-water ports, so for Russia it is vital. It offers the United States no comparable advantage. The same is true for parts of Ukraine along the Russian border, which Moscow would like to control for security reasons. These regions will always matter more to Russia than to us. The case against Russia’s annexation of Crimea is based on the principle of national sovereignty. That principle, embodied in the Peace of Westphalia, which ended the Thirty Years War in 1648, asserts that every country is independent, all have equal rights, and they should not meddle in each other’s affairs. According to this principle, Ukraine is the equal of Russia, and Russia may not violate its sovereignty. The same should hold true for Georgia, Moldova, and other former Soviet republics. But in practice, as Russia’s annexation of Crimea shows, the independence of weak states in often constrained by the strategic needs of a larger neighbor. Small countries near Russia are not the only ones that suffer this injustice. Many in Latin America have long and painful experience with the “sphere of influence” concept. Over the course of more than a century, the United States has intervened in their affairs through invasions, coups, attempts to assassinate defiant leaders, and support for client armies fighting civil wars in which hundreds of thousands died. American leaders carried out these interventions in support of a simple impulse. They do not want unfriendly regimes nearby. It feels unsafe. Enemies far away may be tolerated, but powerful countries have always considered their “near abroad” differently. In our hemisphere, countries like Guatemala, Nicaragua and Cuba play the role that former Soviet republics do for Russia. In theory these countries are sovereign, free to make their own policy choices. Yet we expect them to accept our power. When they do not, we react. After the Soviet Union broke apart, the world was presented with an entirely new set of borders. Whether they are or should be eternal is debatable. The United States was quick to support border changes when that fit our plan to weaken Russia. Now we insist that the new borders must be respected forever. It is unfair that big powers dominate their weak neighbors, but it is the way of the world. This should not lead to abandonment of principles like international law, respect for sovereignty, and non-intervention. On the contrary, all will ultimately suffer if global politics descend to the law of the jungle. Russia is proof, however, that defeated powers do not always stay defeated. So is China. Both were exploited during periods of weakness. Now they are striking back. Like all rising powers, they are setting out to secure the neighborhood.